We’d love your help. Let us know what’s wrong with this preview of Who Chose the Gospels? by C.E. Hill. The Bible contains four Gospels which tell the story of Jesus of Nazareth. And yet, many more Gospels once existed. Who, then, determined which Gospels would, for the next two thousand years, serve as the main gateways to Jesus and his teaching? Recent books and films have traced the decision to a series of fourth-century councils and powerful bishops. After achieving vict The Bible contains four Gospels which tell the story of Jesus of Nazareth. And yet, many more Gospels once existed. Who, then, determined which Gospels would, for the next two thousand years, serve as the main gateways to Jesus and his teaching? Recent books and films have traced the decision to a series of fourth-century councils and powerful bishops. After achieving victory over their rivals for the Christian name, these key players, we are now told, conspired to 'rewrite history' to make it look like their version of Christianity was the original one preached by Jesus and his apostles: the Gospels of Matthew, Mark, Luke, and John became the prime tools for their re-sculpting of the Christian story, leading to the destruction of previously treasured writings like the Gospels of Judas, Mary, and Thomas. Are the four canonical Gospels, then, in the Bible as the result of a great, ecclesiastical conspiracy? Or does this explanation itself represent another 'rewriting of history', this time by a group of modern academics? To ask other readers questions about Who Chose the Gospels?, please sign up. Has anyone else read this book? I thought it an excellent, sober-minded inquiry into the antiquity of the fourfold Gospel. Hill deserves a lot more of an audience than the history-twisting Pagels or Crossan. How do we know there are only 4 Gospels? After all, aren't there other Gospels written around the same time, like the Gospel of Thomas or the Gospel of Judas? Why not slap them into the New Testament with Mathew, Mark, Luke, and John? Hill tackles this question, and he does a heck of a job. Liberal textual critics believe that those "other" gospels should be on equal footing with the big four. They also teach that the big four weren't decided upon until the 4th century. Hill points out that the How do we know there are only 4 Gospels? After all, aren't there other Gospels written around the same time, like the Gospel of Thomas or the Gospel of Judas? Why not slap them into the New Testament with Mathew, Mark, Luke, and John? first book of Seminary. its short, only about 250 pages, but dense. I'd recommend it for anyone who wants to seriously deal with the historical origins of scripture, specifically the Gospels. for an academic book it is an easier read, actually enjoyable at times. What an excellent, enjoyable destruction of the stupid Da Vinci Code arguments. Thoroughly enjoyable read, fact-filled and winsome. Highly recommend to all. This review has been hidden because it contains spoilers. To view it, click here. The fictional claims of Dan Brown, the sensationalized claims of Bart Ehrman, and the more scholarly arguments of Lee Martin McDonald, Ehrman, and others have promoted the idea of an early Christian movement notable for theological diversity. According to this storyline, the imposition of orthodoxy and a church-dictated canon of Scriptures stifled the creative diversity of the early church. Hill challenges this view by demonstrating that it is based on faulty methodology, overstatements, and slo The fictional claims of Dan Brown, the sensationalized claims of Bart Ehrman, and the more scholarly arguments of Lee Martin McDonald, Ehrman, and others have promoted the idea of an early Christian movement notable for theological diversity. According to this storyline, the imposition of orthodoxy and a church-dictated canon of Scriptures stifled the creative diversity of the early church. Hill challenges this view by demonstrating that it is based on faulty methodology, overstatements, and sloppy handling of the evidence. For instance, one scholar claims that "gospels were breeding like rabbits" (2). Yet that scholar finally lists only nine non-canonical gospels that have been discovered. This scholar calls his listing "partial." Hill notes, "It is not unlikley that more Gospels might have circulated before 175. But if they once existed, they have left no record, even in later lists of books to be avoided" (8). Since Irenaeus provides an early testimony to the four-gospel canon, scholars promoting a late canon must marginalize him as an aberration (and not very nice, to boot). But Hill documents at least eight theologians (some of note) close to the time of Irenaeus who share his four gospel canon (Hill also argues that Irenaeus wasn't as mean as some people make him out to be). Having established that Irenaeus and the church of his era did have a four-gospel canon, Hill then works his way back by looking the citations of the four gospels and non-canonical works in the church fathers, gospel harmonies, and even the writings of the non-orthodox to demonstrate that evidence for the four gospel canon extends back to the early second century. Hill is fair in his interpretations of the evidence, noting when some of it is not as clear or a certain as other evidence. "Who, then, first chose the Gospels, if it wasn't anybody in the fourth century? It wasn't Origen, Tertullian, or Hippolytus in the first half of the third century, or Clement of Alexandria or Serapion at the end of the second. It wasn't even Irenaeus or anyone writing in the last quarter of the second century. All these had inherited the same four Gospels from previous generations. "It wasn't Tatian in Rome or Syria or Theophilus in Antioch. . . . It wasn't Justin Martyr, who by the early 150s in Rome was using the same four Gospels, and treating evidently only these four as 'Memoirs of the Apostles,' composed by the apostles and their followers . . .
"The evidence brings us, then, to an earlier time. But how much earlier? While the date prior to 150 are not quite so clear, the four Gospels are known as authoritative sources in the Epistle of the Apostles and the Apocryphon of James in the 140s. Papias, probably in the 120s, knows all four; Aristides, at about the same time, knows 'the Gospel' in multiple individual written expression, including Luke and John, and a decade earlier Ignatius knows at least Matthew and John. And sometime around the year 100 Papias' elder discusses the origins of Matthew and Mark, and, if the argument summarized in chapter 10 is near the mark, Luke and John as well. "How is it that these four Gospels came to be known so widely from such an early time? There was certainly no great council of Christian churches before 150 which laid down the law on which Gospels to use. No single bishop, not even the bishop of Rome, should he ever have made such a proclamation (and there is no reason to think he did), had the clout to make it stick. If there was any authoritative figure who endorsed the four Gospels, the most viable option would have to be, as a tradition known to Origen and possibly Papias' elder said, the aged apostle John. Such a story is a long, long way from historical verification, though that fact in itself does not make it impossible. "But if we set aside that story as likely to be legendary, our search appears to have reached a dead-end. We cannot find who chose the Gospels. It looks like nobody did. They almost seem to have chosen themselves through some sort of 'natural selection.' And this at least concurs with the conclusion of Bruce Metzger, one of the last generation's premier scholars of the New Testament canon, who wrote, 'neither individuals nor councils created the canon; instead they came to recognize and acknowledge the self0authenticating quality of these writings which imposed themselves as canonical upon the church" (227-29). The idea of self-authenticating Scriptures may not sit well with some, but Hill notes that this best with the way the early Christians spoke about the gospels: "Christian writers of the second century do not speak of choosing the Gospels or of the criteria they might have created for making such choices. This is not the way they thought. When speaking of the church's part in the process they instead use works like 'receive,' recognize,' 'confess,' 'acknowledge,' and their opposites" (231). An excellent scholarly approach to the Gospels. The book is short and engaging, yet makes very compelling arguments backed up with solid research. The fundamental premise is that the final selection of the Gospels was not necessarily the result of power politics pushing our more common writings representing alternative views - but was rather a more inevitable selection of dominant teachings. The author builds the case steadily and offers a good counter-balance to more popular (or conspiratorial) v An excellent scholarly approach to the Gospels. The book is short and engaging, yet makes very compelling arguments backed up with solid research. The author builds the case steadily and offers a good counter-balance to more popular (or conspiratorial) views regarding the ultimate canon of the Gospels. He saves the answer for the end - but it is interesting that it may have in fact been the author of the Gospel of John that brought the 4 main Gospels together for the ages. Very interesting read for those seeking the historical view of Christianity. A must read for any Biblical Scholar & Christian. The central theme Dr Hill postulates was to research ancient history and especially the way in which the earliest Church Fathers perceived and viewed the four canonical Gospels. 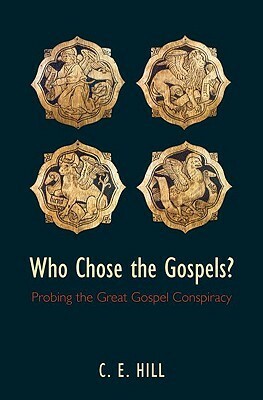 The central axis resolves the whole idea that the Four Gospels were a later collection of biographies and seemingly dictates that it was a know idea that the four distinct from all other "pseudepigraphal Gospels" were seen as uniquely divinely inspired as well as coll A must read for any Biblical Scholar & Christian. The central theme Dr Hill postulates was to research ancient history and especially the way in which the earliest Church Fathers perceived and viewed the four canonical Gospels. The central axis resolves the whole idea that the Four Gospels were a later collection of biographies and seemingly dictates that it was a know idea that the four distinct from all other "pseudepigraphal Gospels" were seen as uniquely divinely inspired as well as collectively authoritative! A must read! Hill provides a solid set of arguments for the historicity and canonicity of the four Gospels. He sometimes leans a little too much on conjecture as he brings the book to a conclusion. Nevertheless the book, as a whole, if full of useful information for those wanting a more solid foundation on the canonicity of the Gospels. The most entertaining read I have read in seminary thus far. Hill does a great job of showing why there are only 4 gospels and why their "selection" wasn't arbitrary. The four Gospels weren't "chosen" by the early church but "received" by the church fathers likely from the apostles themselves. If you love books that crush conspiracy theories, this is for you. Great biblical cover of the topic. The arguments in this book are extremely logical but also accessible. I would definitely recommend this book to anyone who has wondered about this question or who longs for a thorough (and enjoyable) treatment on the topic. I think D.A. Carson gives the best recommendation for this book. He says, "Not many books that are so informed are such a pleasure to read." Very good. Solid research and very well-written! Compelling scholarship and history that makes a important and convoluted topic accessible. Found the Chapters on Irenaeus and Justin to be the most helpful/important, along with the final chapter. Good argument, well-written, but a dry subject. A good book to have on hand if someone is struggling with skeptical arguments - last chapter is best. Protein for orthodox faith. Winning research concerning the historical, regular, reasonable acceptance of, and only, the four Gospels by the early church. Surprisingly fun, with a pinch of witty sarcasm. A compelling discussion of the origins of the four canonical Gospels of Matthew, Mark, Luke and John. Hill takes aim at recent scholarship that asserts that these gospels were just 'four among many' such writings about the life and sayings of Jesus, until the orthodox Christianity emerged, centuries after they were written. Hill methodologically works through evidence from mainly the 2nd Century that suggests that the widespread acceptance of the four traditional gospels as authoritative occurre A compelling discussion of the origins of the four canonical Gospels of Matthew, Mark, Luke and John. Hill takes aim at recent scholarship that asserts that these gospels were just 'four among many' such writings about the life and sayings of Jesus, until the orthodox Christianity emerged, centuries after they were written. Hill methodologically works through evidence from mainly the 2nd Century that suggests that the widespread acceptance of the four traditional gospels as authoritative occurred much earlier than others are prepared to concede. In doing so, he takes on big names such as Bart Erhmann (whose response to some of the evidence produced here would be fascinating), labelling them as 'conspirators' seeking to undermine the traditional understandings of the authority of the gospels. - If the most ancient authorities have it that Matthew was written first, how did that cohere with the modern scholarly consensus around Mark being the first Gospel committed to papyrus? - Is it even physically possible that the apostle John was around long enough to write the Gospel of John, or testify to the veracity of the synoptic gospels? Engaging and witty writing on an important topic. Technical yes but in his apprach he obviously works at making the details engaging. This book certainly shows the bankrupt nature of the Dan Brown type conspiracy theories. The last chapter is an excellent concluding climax and defence of the book's argument and of the early church recognizing not declaring the four gospels to be authentically revealation from God about Jesus Christ. If Charles E. Hill was giving a lecture on this subject, I'd be all ears. Reading it, however, was challenging - not because he doesn't present some very interesting facts, but because it's pretty dry. A solid (though not spectacular) and charitable refutation of the nonsense peddled by those who think that the reception of the four canonical Gospels was the result of nothing more than power politics. Solid, thorough answer to the question at hand. Explores loads of early Christian and non-Christian writings to wrestle with the question of how we arrived at accepting the Gospels of Matthew, Mark, Luke, and John. This books should (but won't) put to rest all the mythology and conspiracy theories regarding the four-fold gospel standard that Christians embrace. A very nice treatment of issues related to the gospels and their canonization. Hill is also a very fun writer. Read for NT1 class under Dr. Jonathan Pennington. If the topic suits your interest, I find that Hill's work is concisely thorough while maintaining a modicum of enjoyability.